Combination of booths, pedestal tables, and mobile folding stool tables for flexibility. Specially created graphic tabletops for the school theme. 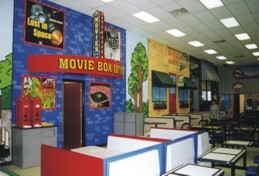 The entire wall painted with the historic downtown stores, and a flashing movie sign marquee. We received a wonderful testimonial from the Turlock High School Food Services! Our artists hand painted a mural on the wall representing the historic downtown district. The students enter the serving line through the Movie Box Office with the flashing Theatre Marquee lights! What you see here was bare white block walls before our artist started to paint. 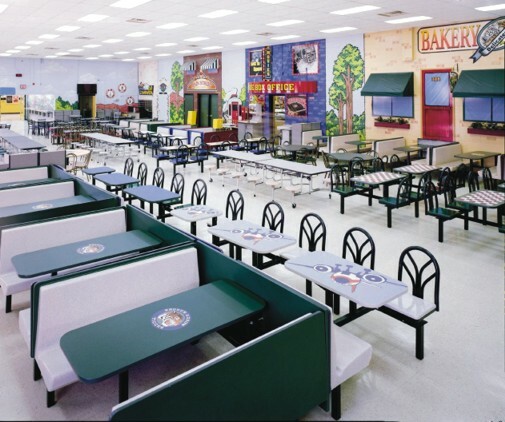 Colorful tabletop graphic laminate we created for this school's themed dining room. A combination of booths, pedestal tables, and mobile folding stool tables give this room a multi-function capability.